PC1 would not be able to access it since , the IP address (192.168.2.1) itself is on a different network.Gateways are devices which should belong to the same network, and has knowledge about how to reach other networks. The following sequence of events follow, once the TCP/IP adapter settings is configured with the gateway address. 3. 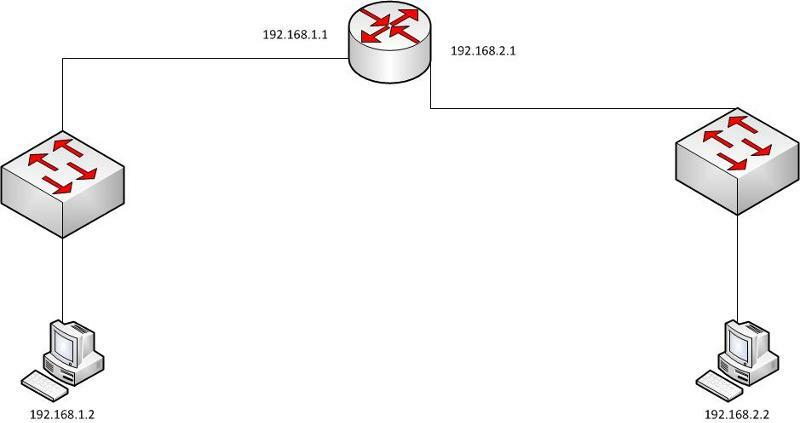 The packet would be sent to the gateway IP address configured on the PC as the destination is on a different network and the PC does not have any other option as a specific route to the network 192.168.2.0 is unavailable on the routing table of the PC. 4. Since the specific route is unavailable, the default route on the PC, which is populated by the operating system after the gateway IP address is configure would be used. 6. To generate the frame, the destination mac-address of the gateway is required. 8. The router responds with an ARP reply. 9. PC1 uses the mac-address in the ARP reply, constructs the frame and sends the packet to the router. 10. The router is configured with two IP addresses, 192.168.1.1/24 and 192.168.2.1/24. When configured, routing tables are populated and 192.168.1.0/24 and 192.168.2.0/24 ( the corresponding network addresses) are listed as directly connected networks. 11. When the packet reaches the router, the destination IP address is looked into (192.168.2.1). The router checks if it is aware of the destination network for the destination IP packet. 12. Since the network is a directly connected network, the router knows which interface to use. 14. PC2 would send an ARP Reply with it's mac-address.